TRENTON JOSEPH CASILLAS BAKEBERG and KEALA KELLY Tiokasin Ghosthorse continues to bring us reports on events occurring at Standing Rock, North Dakota and the efforts by thousands of water protectors to stop the construction of the Dakota Access Pipeline. Featured at the top of the hour is Trenton Joseph Casillas Bakeberg from Eagle Butte, South Dakota. Trenton (Lakota name Ka Hni Ka Pi - The Chosen One), an enrolled member of the Cheyenne River Sioux tribe, Mnicoujou and Itzapico bands, will talk about his experience of being forcibly removed from prayer on Oct. 27, arrested and detained by North Dakota law enforcement. In the second half-hour, Tiokasin welcomes back Keala Kelly, Kanaka Maoli filmmaker, journalist and activist from Hawai’i. Keala and other Hawaiians and Pacific Islanders have been publicly critical of the upcoming animated Disney film, “Moana,” which is due to open in theaters over Thanksgiving weekend. 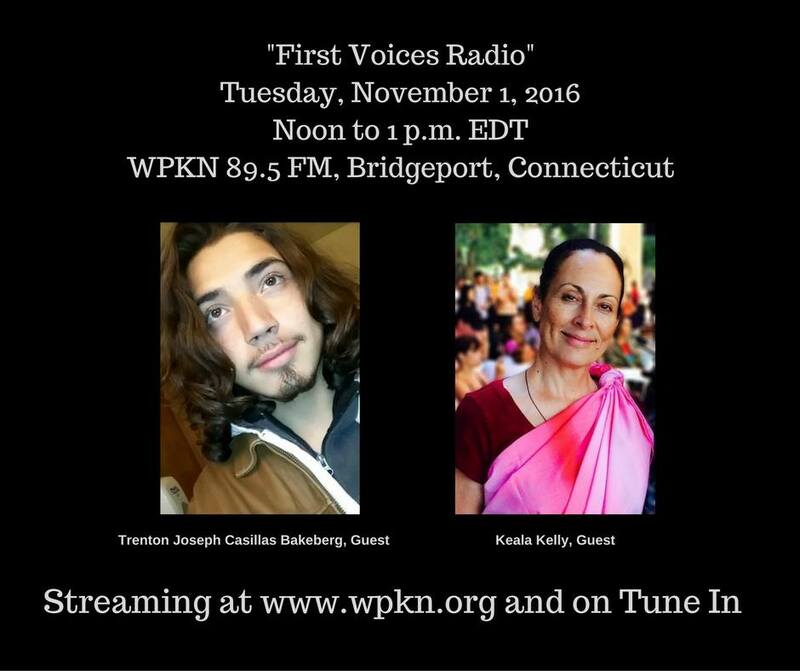 Tiokasin will be talking with Keala about the continuing theft and commodification of Pacific Islands peoples and culture. On Oct. 28, Indian Country Today Media Network published Keala’s op-ed titled, “Making Native Sense of ‘Moana.’” Keala also will provide an update on the push to federally recognize the Native Hawaiian “community” and why the majority of Kanaka Maoli people are opposed to it.